Through my creativity coaching, teaching, art making and art selling, I meet people of all stripes. Each conversation or transaction contains the simple acts of giving and receiving. Over the past few years, I’ve been cultivating an attitude of gratitude for the huge abundance in my life- a gorgeous glass studio with working kilns, a wonderful son, family, friends, and a home in a vibrant and inspiring city where I can grow vegetables year round. I feel especially blessed in that I generally get to do what I believe I am here to do: bring beauty, play, and delight into the world. In the past few years three close friends and two friends of friends were not so lucky. Each was diagnosed with cancer. I gifted them with one of my vibrant pink water glasses......a pink that shifts to gold and aqua and that shimmers in a way that somehow strikes me as healing. I wanted these special women to have something that brought daily comfort and was a reminder of beauty in the world. I engraved the words “Love, Light, Healing” on each glass to remind them that they are cherished as they drank water from it during their chemo treatments. Two of these amazing women have moved on, as some Native Americans say, "to the next camp." But those that are now cancer free have commented on how the glass indeed helped make their days lighter. Susan and her special Glass of Comfort. "I once overheard someone say that life is too short to not fill it full of beautiful things. I've always loved this idea, and my house is full of art and things that I find to be beautiful. The one part of this statement though that I never considered was the "life is short" part. I received a diagnosis of breast cancer in April of 2010, and before I knew it, chemo meds were running through my veins and I felt sick much of the time. Friends and family all rushed to support me, shifting my idea of "beautiful things" to appreciation for all of the beautiful people I am fortunate enough to call my friends and family. Throughout my treatment though, I also received many thoughtful and meaningful gifts. My favorite by far was not only a beautiful thing, but also came from a very beautiful person. Marcia is a friend of a friend, yet one day a box arrived in the mail with a stunning drinking glass that fills with sparkles when I pour water into it. There were days during chemo treatments that left me unable to eat, but I always had at my side this beautiful tumbler full of light. It was like drinking fresh water that had been infused with something healing and energizing. 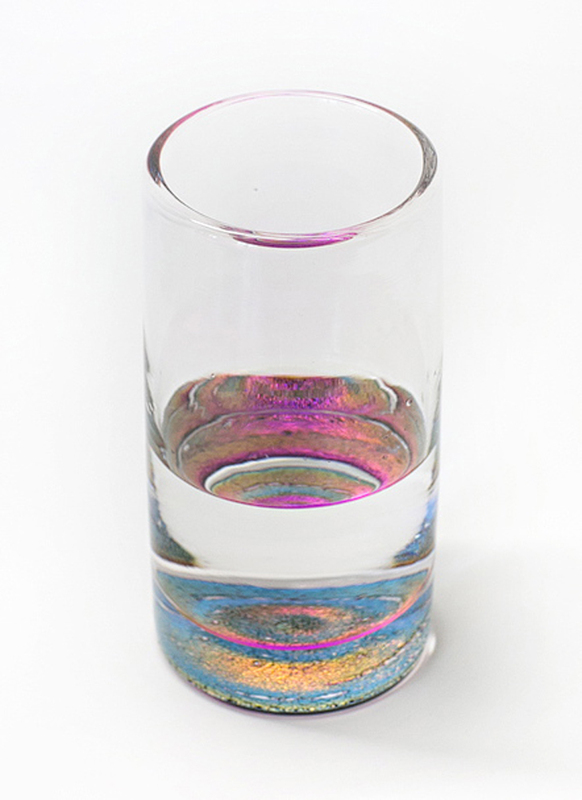 This glass is now at the top of my list of favorite beautiful things. I am well now, but I still keep it by my bedside. I don't think I will ever stop feeling that there is something magical in the water with every swallow I take. Life may be short after all, but this small, wondrous work of art will keep me happy and healthy all the way to the end. I love it. Thanks Marcia."